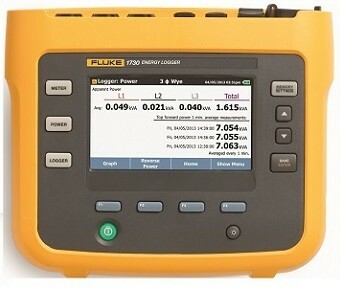 The new Fluke1730 Three-Phase Electrical Energy logger introduces a new simplicity to discovering sources of electrical energy waste, by analysing when and where energy in your facility is being consumed, from the service entry down to individual circuits. Profiling the energy usage across your facility helps you identify opportunities for savings and providing you with the data you need to implements changes. The new Energy Analyse software package allows you to compare multiple data points over time to build a complete picture of energy usage, which is the first step to reduce the cost of your energy bills. Key measurements: voltage, current, power, power factor and associated values. Display: Bright, colour touch screen graphic display. Data logging: all measured values are automatically logged and can be reviewed during logging. >20 separate logging sessions can be stored. User interface: quick, guided, graphical set-up ensures correct capture every time. Intelligent verification indicates correct connections have been made. Field set-up: Direct through the front panel, with no need to return to the workshop for set-up download or connect a computer to the electrical panel. Wide range power: power instrument directly from the measured circuit, allowing the instrument to be secured safely inside electrical panels. USB ports: Two, PC connection and the other for fast, simple download to standard USB drives, or other USB devices. Safety rating: Highest in the industry at 600V. CAT IV/1000V CAT III rated for use at the service entrance and downstream. Measurement accessories: flat voltage cable and thin flexible current probes ensure easy installation in tight spaces. Battery life: Lithium-ion battery with four hour operation (backup time) per charge. Application software: The new “Energy Analyze” software provides download, analysis and automated reporting.